It's easy to see why off the shoulder dresses are so popular right now -- they have this alluring quality to them that makes the wearer look so feminine and romantic in the best way possible. Wrap dresses are one of the hottest looks at the moment and it's easy to see why. They hug the body in all the right places, show off just enough decolletage and then float away at exactly the right spot. I've yet to see a woman that a wrap dress doesn't flatter and I almost think she doesn't exist. 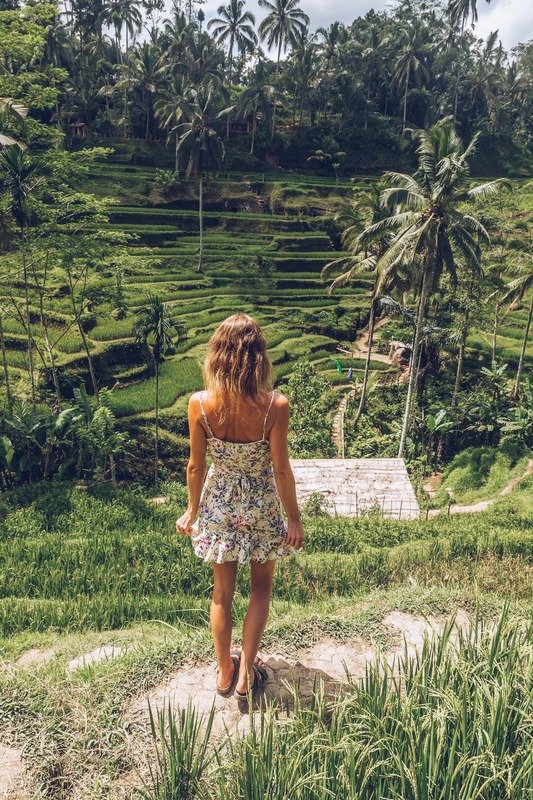 One of the most Instagrammed spots in Bali is the Tegenungan Waterfall, just outside of Ubud. I'm always a sucker for a beautiful view, so after seeing so many gorgeous shots, of course I had to go. We decided to get up nice and early to beat the crowds and am so glad that we did. I'm so excited to begin sharing all of the designs from the first collection of KAYVALYA and I thought that I would start with my very favorite! You guys!! I'm so excited to finally share my new clothing line with you. I seriously can't believe that the day is finally here. Ollie and I have been working away on this for the past few months in Bali and I'm so proud of what we've created. It's been about a week since we left Bali and I already feel like it was a lifetime ago. I miss the heat, the beach being just footsteps from our door, the tasty food and the relaxed way of life more than I can explain. We spent 3 months on this beautiful island and it has become a second home.